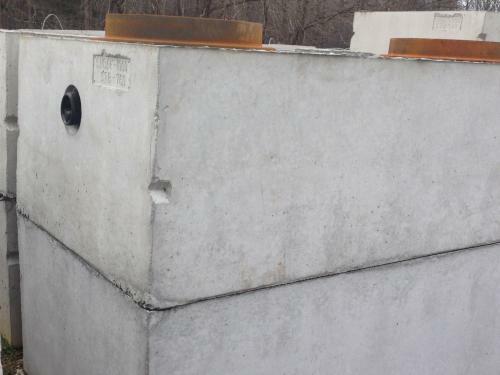 Shoaf Precast Grease Interceptors offer high performance grease removal - decreasing maintenance costs and deterioration of collection systems. Our interceptors effectively manage effluent waste, saving money and aggravation by protecting septic systems and sewage lines from plugging up and failing. 1,000 Gal. 8,500 10 ft. 5 ft. 66" 54" 52"
2,000 Gal. 16,000 15 ft. 8 ft. 68" 57" 55"
3,000 Gal. 20,000 15 ft. 8 ft. 82" 69" 67"
1,000 Gal. 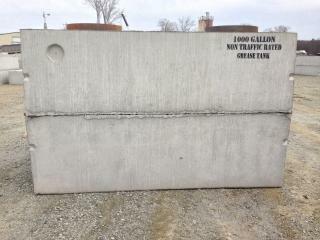 9,500 10 ft. 5 ft. 67" 57" 55"
1,500 Gal. 13,000 13 ft. 7 ft. 71" 59" 57"
Don't see what you're looking for? Custom sizes available upon request. Feel free to contact a Shoaf Precast representative for additional assistance!